Connecticut is yet another nearby state that stands as a stranger to me, kinda like the neighbors three doors down that seem like happening people, but you are never around when they are home. I grew up somewhat close (2 hour drive) and yet, the only time I've stopped in was for a graduate school interview at Yale. As you can deduce, things did not work out for Yale and since then, I haven't been back. Thus, I was thrilled to get some coffee from a New Haven coffee company called Willoughby's Coffee & Tea. The place had not really made my radar but their cafes look pretty nifty and their coffee offerings intriguing. The first of the two coffees I tried was a 2008 Cup of Excellence winner from Guatemala. I sampled it in the typical three methods of drip, siphon and french press. The drip I dove at first. The ensuing mug demonstrated a coffee smacking of sweet honey and caramel popcorn, with a wheaty aftertaste, a tiny sour kiss and an overall pleasant smoothness. This was by far one the sweetest coffees I've had in a long time. The siphon had a tad heavier body. This cup possessed more of a chocolate and caramel sweetness as well as bits of fig, date and a milky texture. Different result but still delightful. The french press generated a lighter coffee similar to the drip, though with much more prevalent caramel and a nice chocolate milk texture and flavor. The fig and ending wheat were still present and some unique notes of spice also showed up; also a great cup. To say I was satisfied would be putting it lightly. 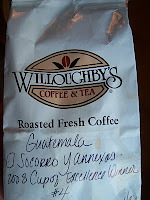 If Willoughby's locations can serve up espresso as well as they can roast coffee, then Connecticut would finally have a true pull for me to visit. If you're looking for a well-roasted Connecticut coffee, order a pound from Willoughby's.